7 Months later, this time wearing the rainbow stripes around my chest rather than racing to gain them, it felt like things were starting up where they left off. Maja and I were battling it out at the front of a race. This weekend however, one of the best women in the world was also my Canadian teammate Emily Batty, who showed she is not only aiming to make the Olympic team, but can go to London and perform. It’s always exciting when new riders reach the podium, and in such a convincing fashion, as it raises the bar for all of us. I couldn’t help feeling proud mid-race at the level and depth of the women’s field. The racing was tight, fast and covered some pretty gnarly sections. It was awesome. Photo By Rob Jones And the race breakdown? I had one of my best starts ever, only to get caught behind a crash about 150 m in and ended up way back watching the girls in front of me snake up the switch back climb with no passing opportunities. But yes, I have lots of experience coming from behind in lap 1 and by the start of lap 2 I was up to 2nd chasing down Annie Last with 5 women in hot pursuit behind me. I got to Annie and took over the lead, but didn’t have my billy goat legs under me quite yet and was reeled in by the chase group of 5 behind me. Soon it was a group of 3, Maja, Emily and myself. The pace was tough on the climbs, but we were so evenly matched I didn’t feel I had the jump to make a clean break. I sat in waiting, and waited too long. Whenever I would plan for an attack, Maja anticipated it and accelerated, neutralizing it. If I were to go back and redo the race, I would have tried to be the one dictating the pace more, I would have fought harder for first wheel into the descents feeling I lost the race by getting yoyoed off the back following down the descents. But you don’t get to go back, you go forward and do it better next time. It was a solid start to the season, actually my best ever result at round 1 and it was definitely exciting to see new women taking to the front. In the end it was Maja Woslosczcka of Poland followed by Emily and Myself. 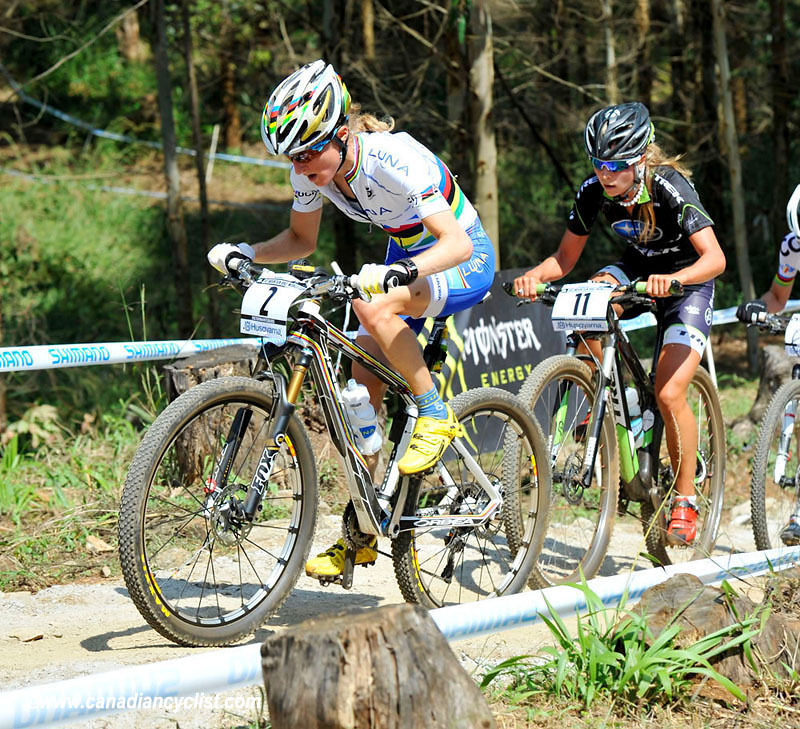 Ester Suss of Switzerland took 4th and Julie Bressette 5th, while Luna team-mate Katerina Nash took 6th. Being March I am sure you will see some turn around in the results as the usual suspects come into form, but like every other year you will also see many break-through rides as the future riders of our sport start to shine. What a class act you are! Well-written, thoughtful comments from a true champ! Wear your New Brunswick tartan MTB kilt in London! Let us mail you one of our hand made kilts for good luck! I tried to send you a message on twitter.. I'm sure you are busy training and there are lots of crazies out there. We're nuts but not crazy! Obviously, you wouldn't race in it, but they're pretty cool rigs.